Wars end would bring the beginning of that better life folks had been hoping for. After years of curbing our enthusiasm the pent-up hunger born of war sacrifices and denial was unleashed sending us on a bender of a buying binge. 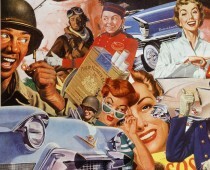 Americans would eagerly enter the material age of post-war promises with whetted appetites and overflowing wallets. 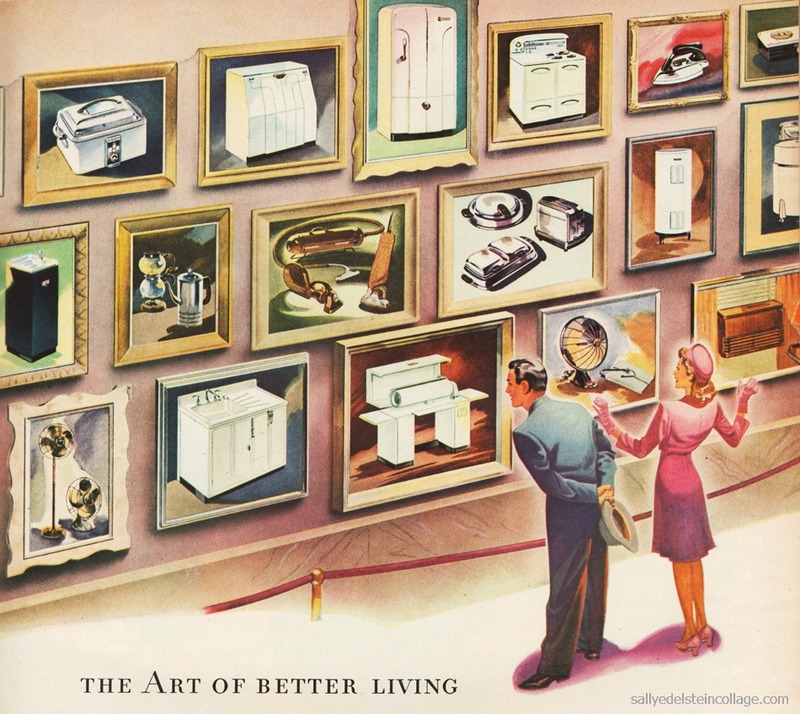 Sure plenty of things were still rationed but the material dreams kept coursing through the culture, seductively displayed in glowing ads as brashly triumphant as we were. Miraculously the drabness of years of “use it up, wear it out, make it do, or do without”, were behind us. What awaited was a colorful world of all manner of unparalleled ease, the most wished for, never before things-never before because it was never possible before, things that would make you proud of your choice and the envy of others. Everything was so new, so thrillingly new, you’d never seen it before, but once you experienced it, you’d never be without it. 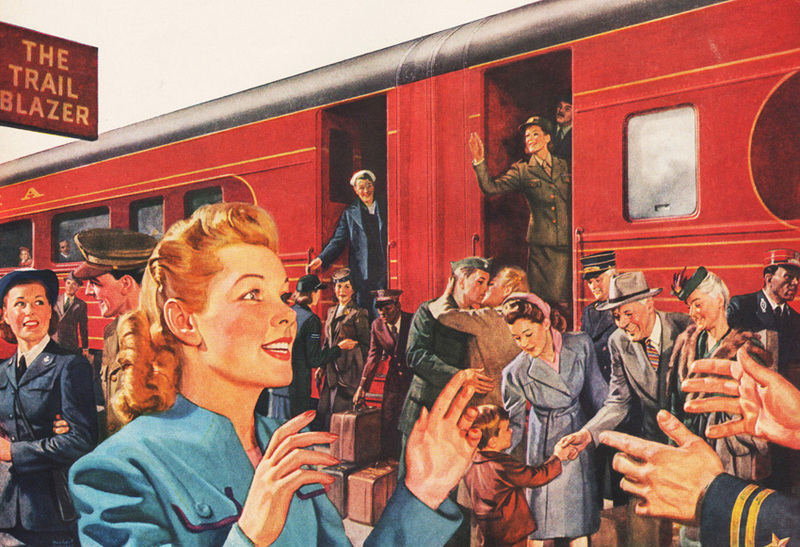 By the thousands, overcrowded transport ships and transcontinental Pullmans crawled across the continent delivering war-weary soldiers back to their loved ones. Now that they were back home for keeps, the moment everyone dreamed was here. With eyes aglow and hearts aflame … awaited the long deferred American Dream for today tomorrow and always. All across the country there was a great “back home” feeling in the air. While for much of the world returning “back home” meant rummaging through the rubble of broken bricks and smoldering wood, in the desolate shell of a former city not yet done burning, Americans were now as carefree as all the push button appliances and new miracle fibers that awaited us. In our country there wasn’t a single building demolished by bombs, a brick displaced or a window broken and the only visible geographical scar was the one we ourselves had made, on the empty deserts of New Mexico. By 1946 the shape of college campuses all across the country were being altered. 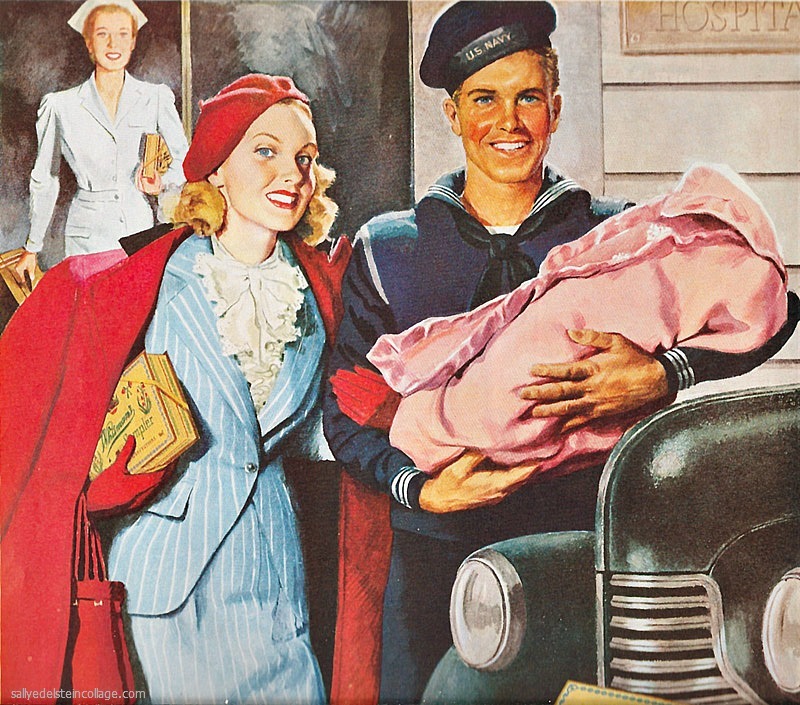 Armies of American veterans were streaming into colleges their little gold discharge buttons winking gaily from their coat lapels, wedging themselves into colleges which hadn’t done any building since 1941 and the results were like trying to pack 2 pounds of sardines into a one pound tin. Schools themselves were changing, becoming West Points for Big Business. Fresh from the war the boys had one strategy they wanted to be deployed directly into jobs as second lieutenants with US Steel or Du Pont. And retire comfortably on a Colonels pension forty years later. Corporations from coast to coast quickly filled with forward thinking vets who traded in their khaki uniform for a grey flannel one . With a firm handshake, they enlisted for life, the golden carrot of retirement loomed in the future like a pot of gold at the end of the work world rainbow. Parents everywhere were under marching orders to have children. Uncle Sam would soon find himself with the greatest batch of nephews and nieces ever presented. They were trooping in by the millions. President Truman presented a rosy picture of the future if all went well according to his Fair Deal program, Americans would work less, play more, purchase more! Why, it was predicted, the average American family would have an income of $12,000 by the year 2000! With a staggering income like that, there would be no limit to how much happiness we could buy.